H.R.H Princess Victoria, who rode one of these bicycles, was the daughter of King Edward VII, and sister to George, the Duke of York, later King George V.
As you can see from the above extract from the 1906 Rudge-Whitworth catalogue, it was very well known at the time that members of the British Royal Family favoured Rudge-Whitworth bicycles. 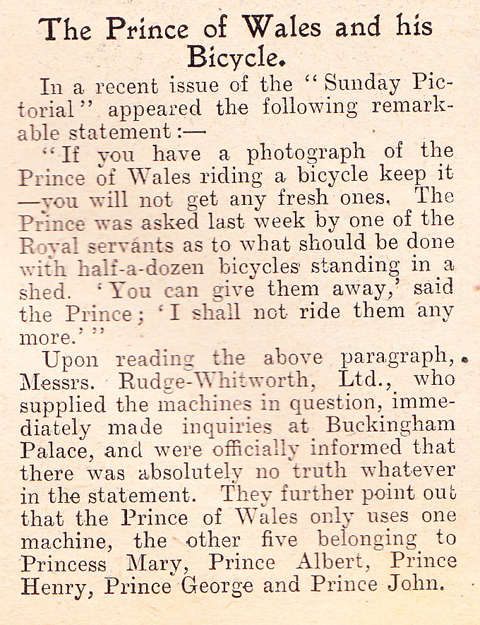 But in early 1915 the ‘Sunday Pictorial’ ran a ‘shock’ story that the Prince of Wales no longer cared for cycling. (In 1915 the Prince of Wales was Edward, son of King George V). The Aero-Special, also known as the Aero Special Lady’s Featherweight, was a revolutionary design at the time. Lightweight frames were not new: advances in tube construction meant that frames became lighter each year through the 189os, reaching a peak just after the turn of the century. Light weight was particularly important, of course, for racing machines. But Rudge-Whitworth applied the technology to its lady’s bicycles, perfecting the technique with the introduction of the Aero-Special. 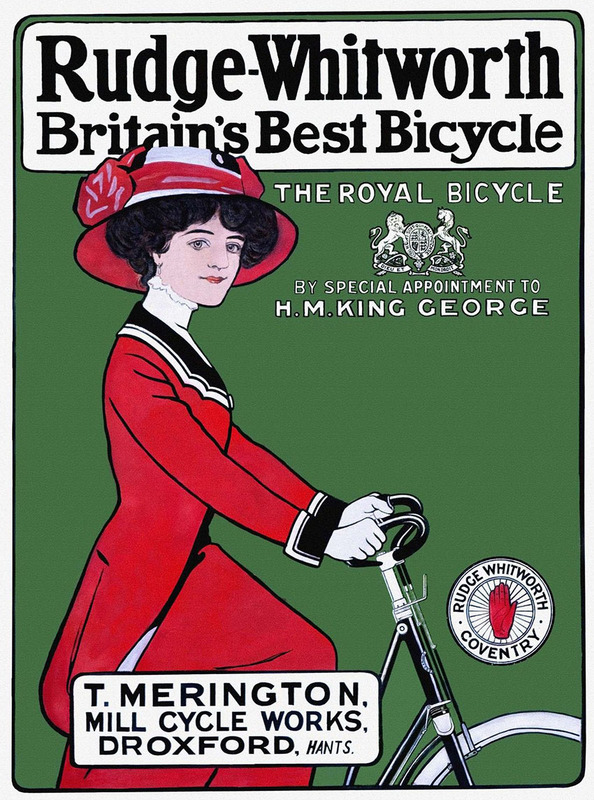 It surprises people in the 21st century that a lady’s bicycle over a century old could be so light. The unique chainwheel style on this model was superseded by the new Rudge-Whitworth ‘Hand’ chainwheel in 1910, and the company added a forward extension to its front mudguards in 1912. The lightweight chaincase with clear plastic front has been removed from this machine. The paintwork is original, showing some of its box lining, and a few parts of the paint have been touched up. The wheels are the original ‘Jointed Aluminium’ as described in the catalogue. The Aero-Special has been mechanically restored and is ready to ride.